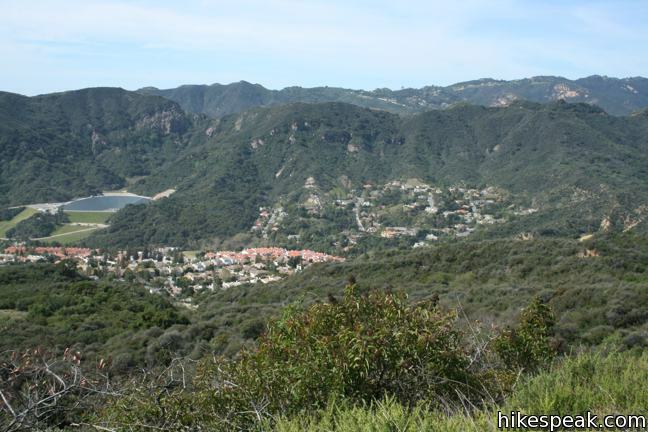 Temescal Peak rises over a wide region of the Santa Mountains triangulated between the Pacific Palisades, Topanga, and Calabasas. 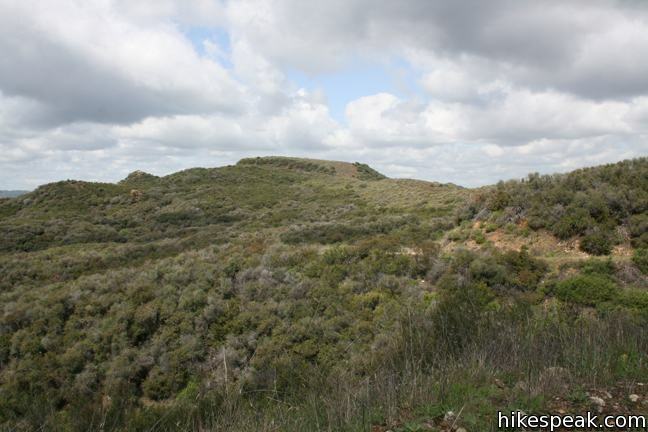 The peak sits on Temescal Ridge, which runs north to south between Santa Ynez Canyon and Temescal Canyon in Topanga State Park. 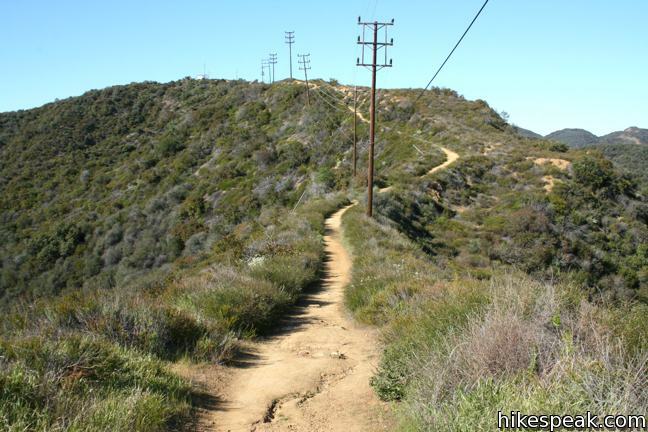 Only seventy vertical feet separate the summit from Temescal Ridge Trail, a service road running down the ridge, making the final climb to the top a near effortless ascent. 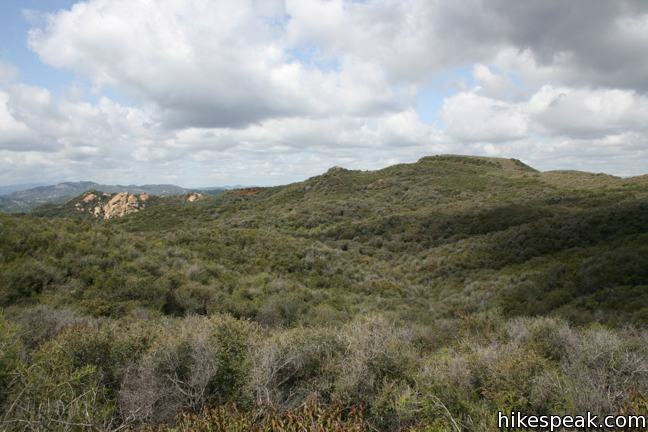 The not-so-prominent peak does manage to provide 360-degree views over the range, and is one of the highest points in the Santa Monica Mountains at 2,126 feet. 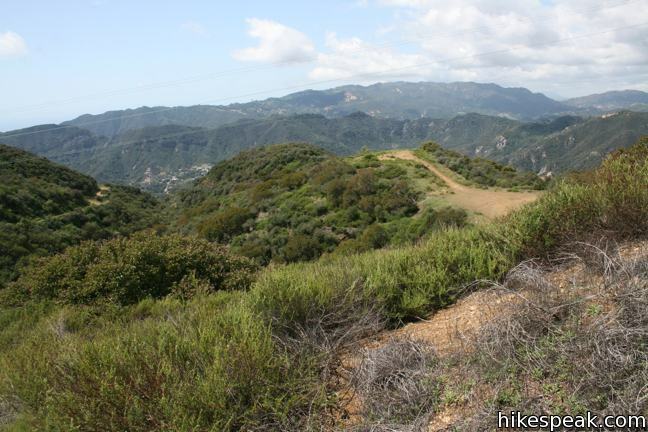 Temescal Peak can be reached from a number of trailheads, but this trail report will concentrate on two southern approaches from starting points off Palisades Drive. 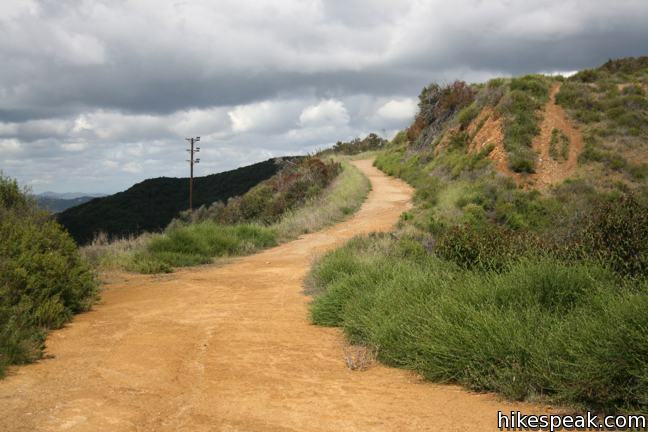 One route, beginning up Trailer Canyon Fire Road, offers a 7.6-mile round trip hike with 1,200 feet of elevation gain. 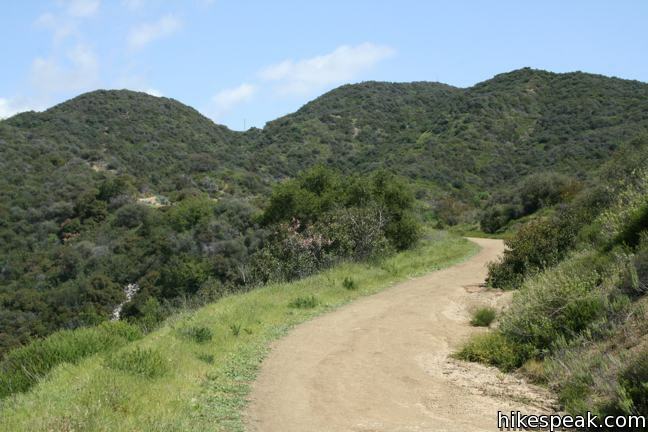 An easier route starts up Palisades Highlands Access Trail for a 5.8-mile hike with 575 feet of elevation gain. 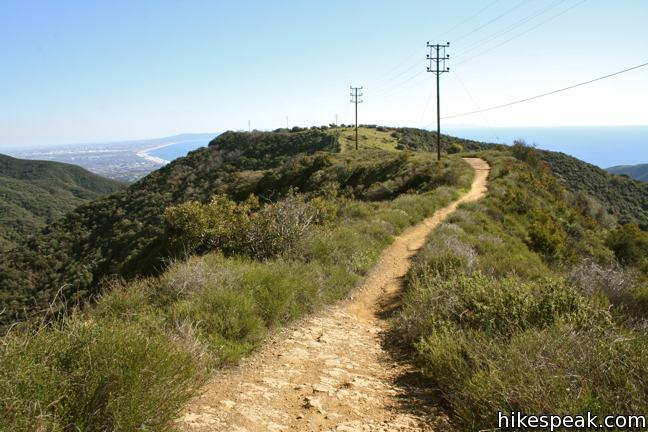 Both options take Temescal Ridge Trail north to the summit. 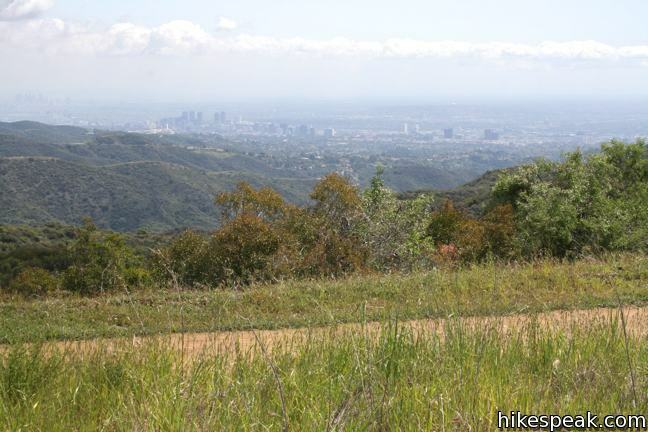 The truly ambitious could also begin hiking from the very bottom of Temescal Ridge Trail in Temescal Gateway Park for a 10.5 miles round trip hike with 1,750 feet of elevation gain. 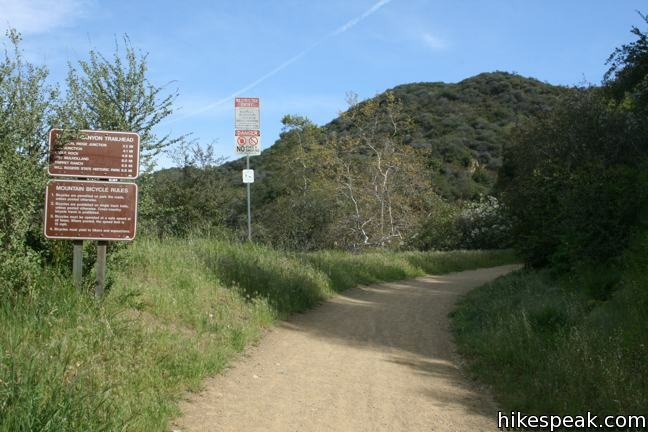 Additionally, hikers can get to Temescal Peak by passing through Hub Junction, extending hikes to Eagle Rock or exploring the north end of Temescal Ridge Trail on a trek to Temescal Peak from Reseda Boulevard. The short route begins up a concrete road built into a steep slope composed of drainage ditches and retainer walls. 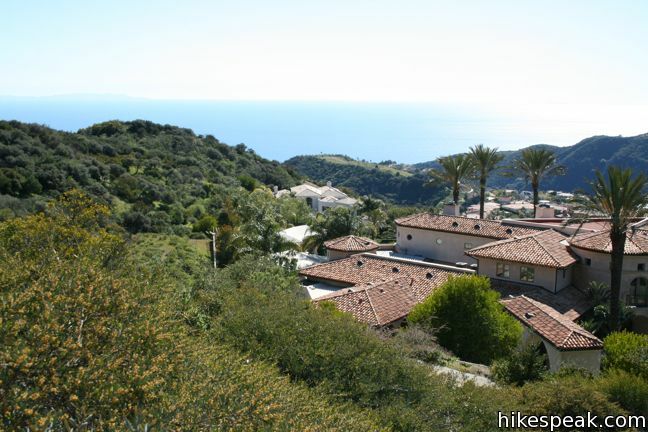 As you leave the affluent development above Palisades Drive, views over the Pacific Ocean and surrounding mountains expand. 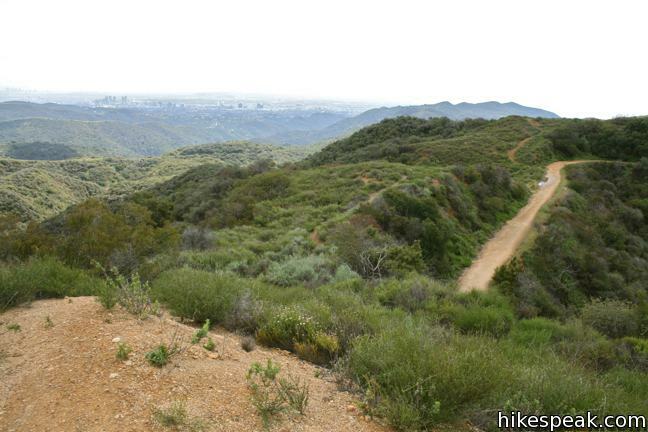 While this trail is farther south than Trailer Canyon Fire Road, it begins 625 feet higher up the ridge, making for an easier hike. 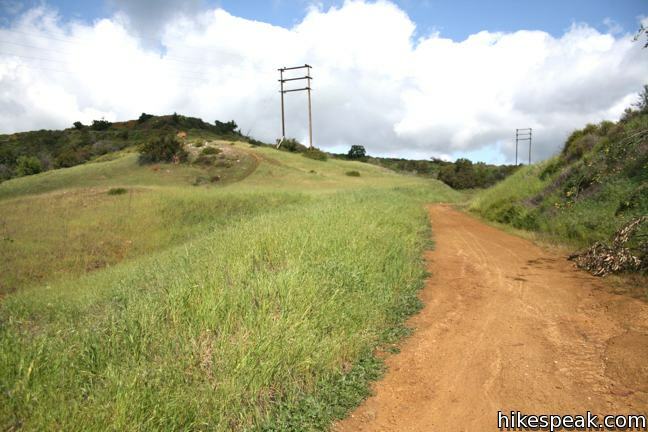 After just a quarter mile, the trail comes to a T-junction with Temescal Ridge Trail. Turn left toward Temescal Peak. 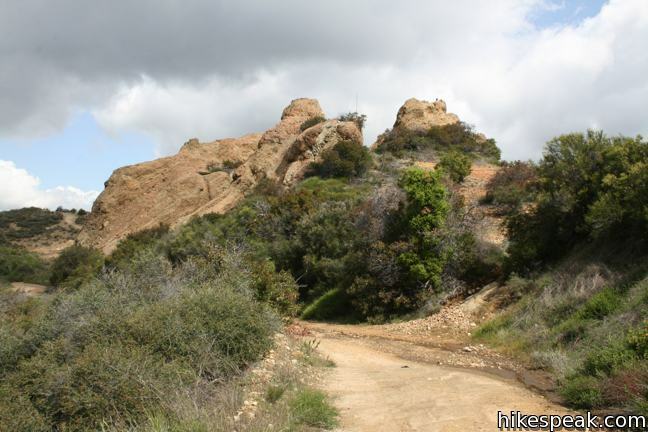 To the right, the trail descends 275 feet to Skull Rock, a fun outcropping half a mile down the ridge, before continuing down to Temescal Gateway Park off Sunset Boulevard. 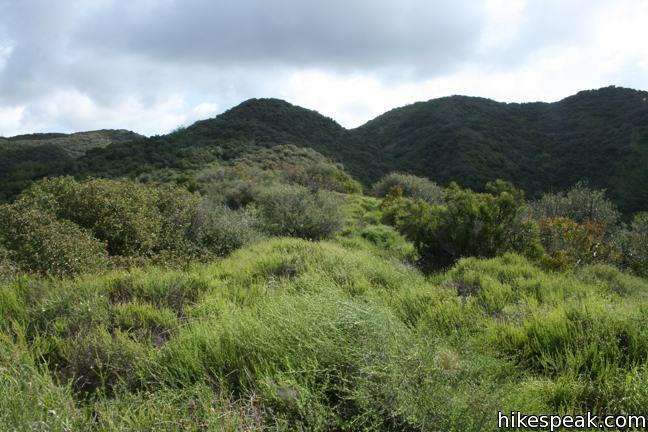 Temescal Ridge is covered in low grasses and sagebrush that enable sweeping views. To the south is a lovely perspective of Santa Monica Bay and the sprawling civilization of Los Angeles. 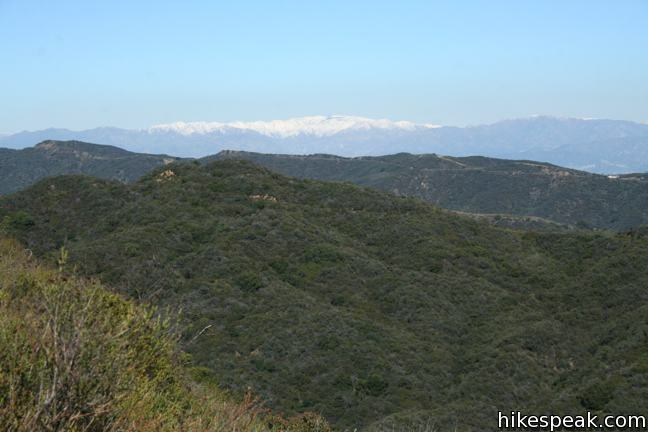 To the east, over the ridges of the Santa Monica Mountains, rise the loftier San Gabriel Mountains. A third of a mile north of the junction, the road passes through a section of trees and brush that provide some of the only shade on the hike. 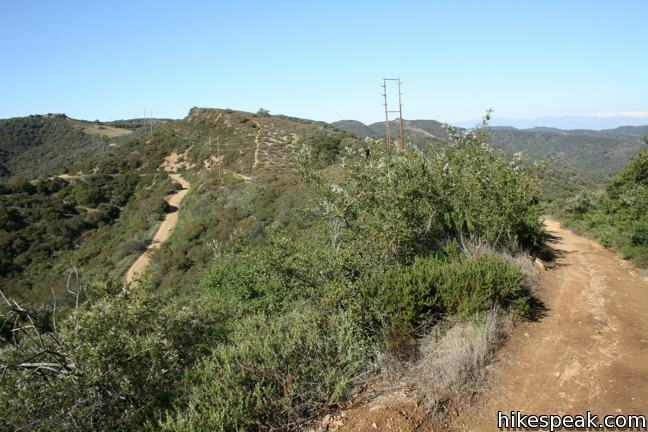 Less than a mile up the ridge, the road crosses the radio-towered summit of Green Peak at 1,966 feet, and drops down to a junction with Trailer Canyon Fire Road, 1.15 miles from the Palisades Highlands Access Trail. 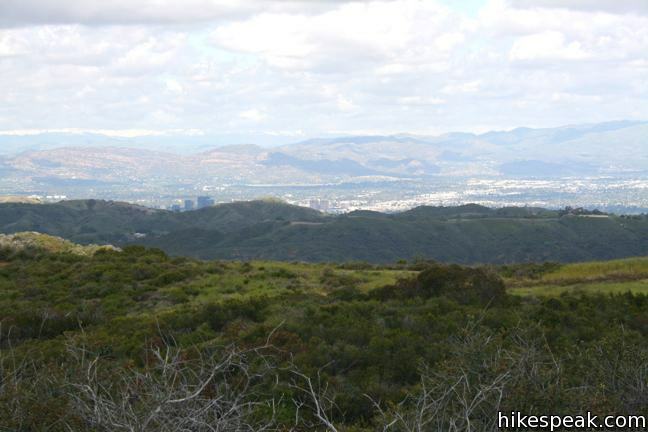 From here it is another mile and a half to Temescal Peak. 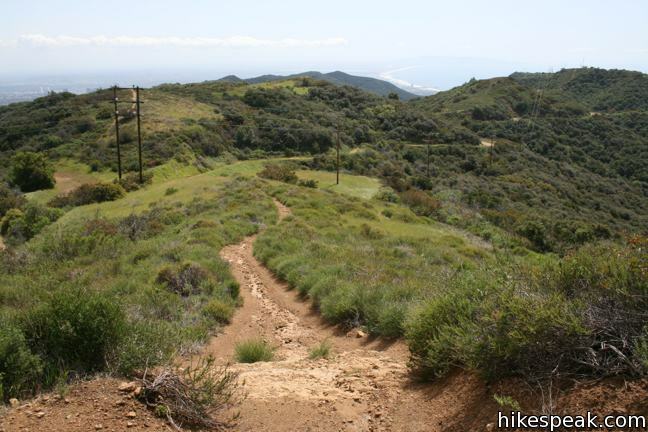 The more challenging route provides excellent views over Santa Ynez Canyon. 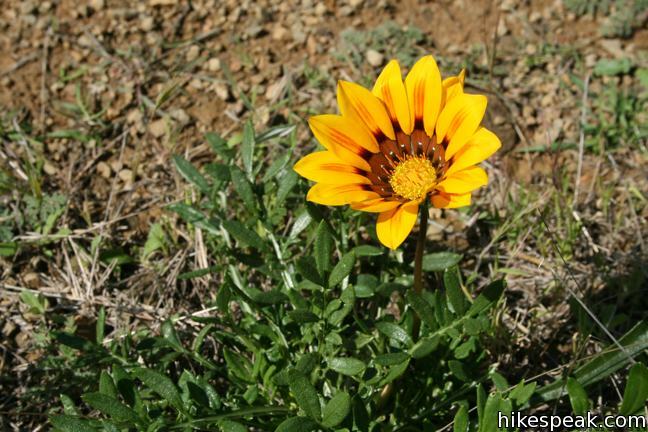 Begin hiking up the dirt service road, which is well graded except for a few rocky sections, making it a popular mountain biking trail. About 0.3 miles up, the road passes a single out-of-place palm tree, juxtaposed against the indigenous chaparral. The palm stands alongside a small creek that carries rainwater off the ridge. 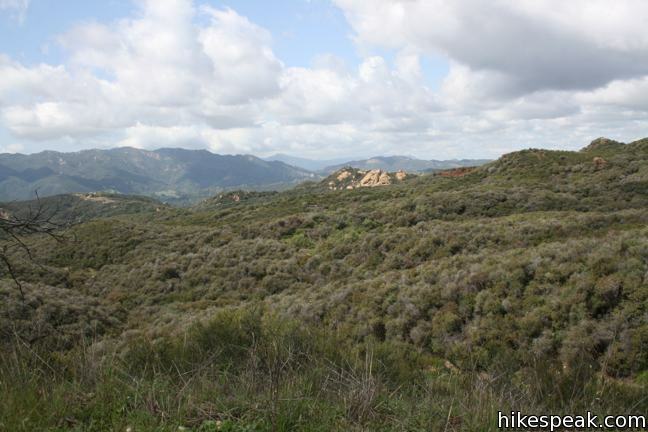 After half a mile, the road swings east, providing broad views over Santa Ynez Canyon and the surrounding mountains. 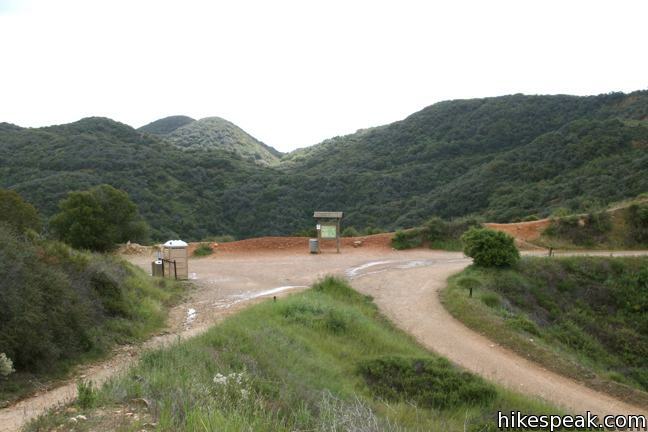 Three-quarters of a mile from the start, the trail passes through a metal gate and enters Topanga State Park. 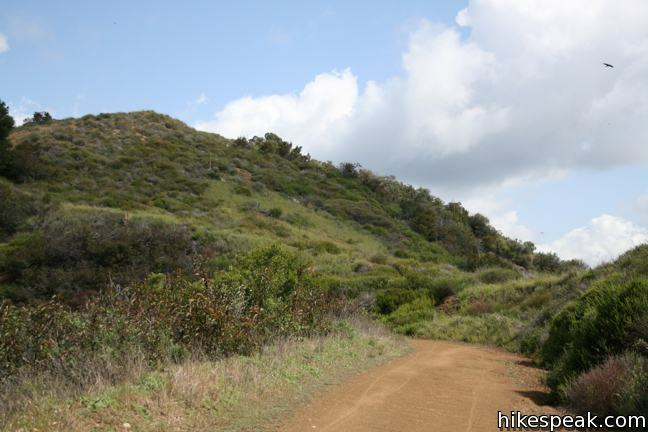 To the left, a small footpath ascends a clay gully and crosses a lush ridge up to Temescal Ridge Trail. After 2/3 of a mile, this steep track reaches a landing on Temescal Ridge just north of the top of Trailer Canyon Fire Road. No time or energy is saved by taking this route. 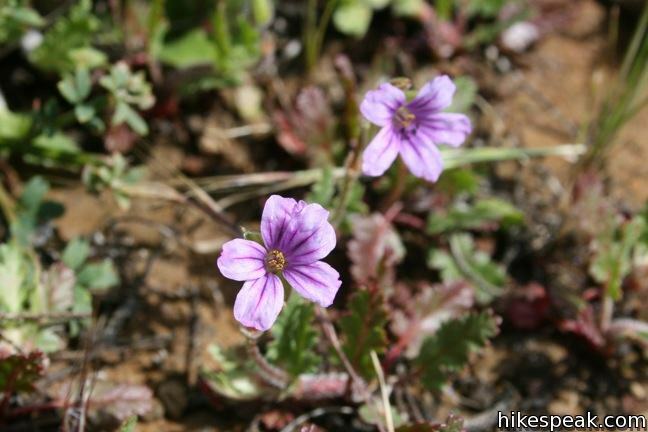 The trail is rarely used and extremely overgrown, probably receiving more traffic from animals than humans. This is definitely the toughest way up, so wear long pants and prepare to bushwhack through brush if you decide to trek this way. 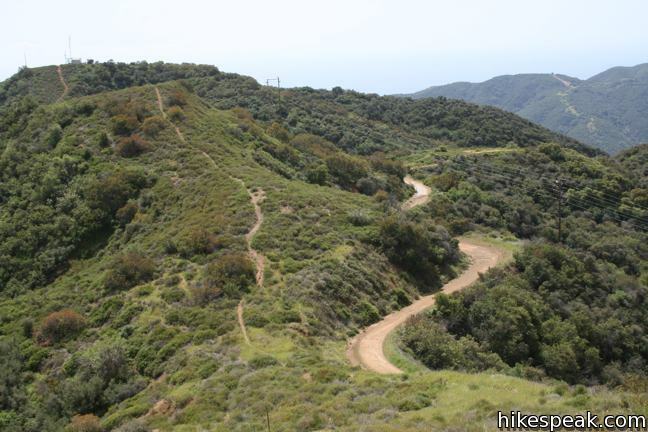 The more sensible option is to continue up Trailer Canyon Fire Road, which weaves progressively farther up the ridge, gaining 550 feet over 1.5 miles to reach Temescal Ridge. The views expand as you go, and the wide road provides easy travel. 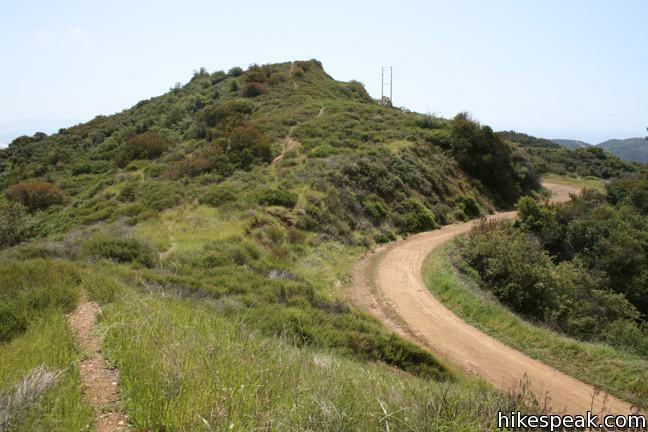 When you come to the end of the road, turn left and head north up Temescal Ridge Trail. 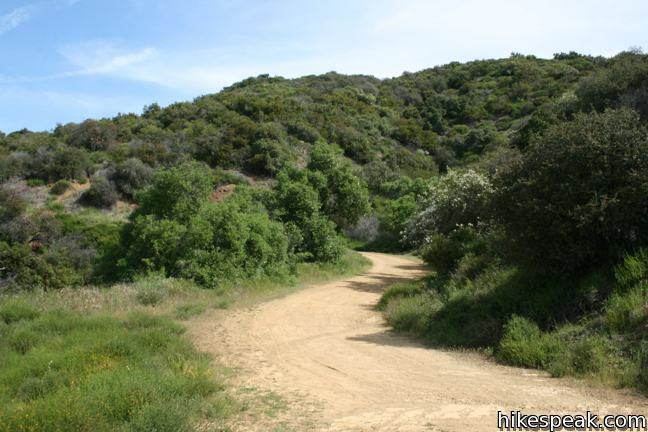 Follow the winding road up Temescal Ridge. The broad views are only slightly diminished by power lines sharing the ridge. In addition to the service road, a single track runs along the ridge parallel to the road. 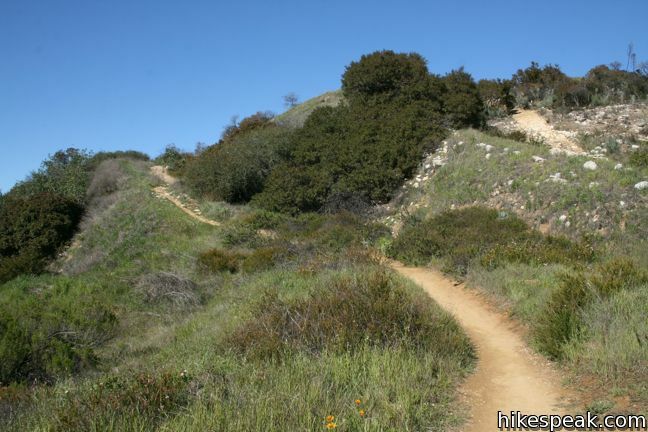 Similar to the hiking experience on the ridges to the east (Sullivan Ridge, Westridge, and Canyonback Ridge), the single track can be used to add fun variety to the hike for those keen to stray from the service road and explore more of the contours of Temescal Ridge. Temescal Peak happens to be the highest point on the ridge, but many of the other crests are only a hundred feet shorter. The single track crosses all of these undulations, offering extra exercise to those who venture off the road. 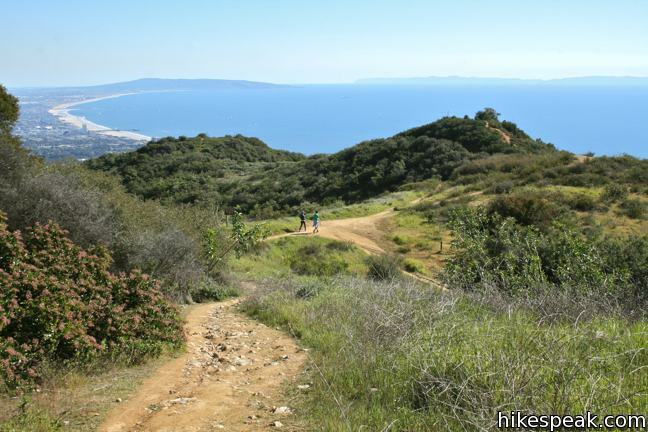 A gradual mile and a half from the top of Trailer Canyon Fire Road, Temescal Ridge Trail wraps around Temescal Peak and comes to a junction with the Backbone Trail, starting its westward journey from Will Rogers State Park to Point Mugu State Park. Prior to this, a footpath leaves the road and goes up the south side of the peak, but because the summit is only 70 feet above the road and not much taller than previous crests, it is easy to walk right past the turnoff. 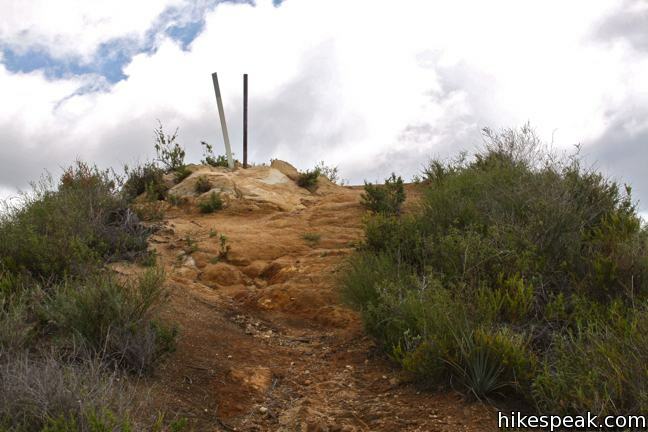 Backbone Trail provides the most obvious route to the top of Temescal Peak. 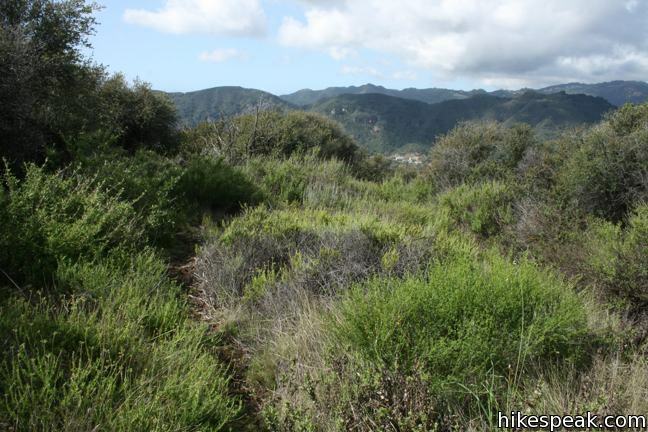 Turn right up the singe track and backtrack around the crown of Temescal Peak. After just a tenth of a mile, break off to the left on one of the footpaths to the top of the peak, another tenth of a mile up. Two poles and a USGS survey marker sit at the summit. 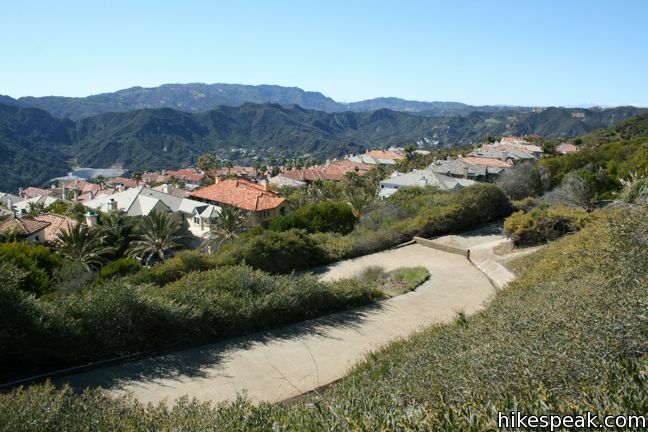 To the east, a majestic series of rolling ridges leads to San Vicente Mountain. To the north spreads San Fernando Valley. 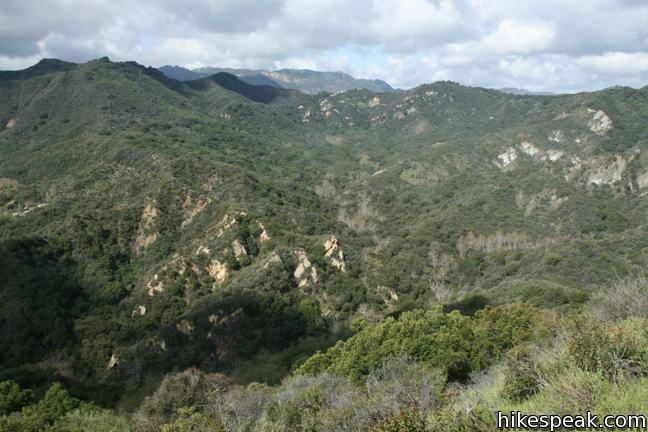 To the northwest are more beautiful mountains, including an alluring nearby outcropping, Eagle Rock. 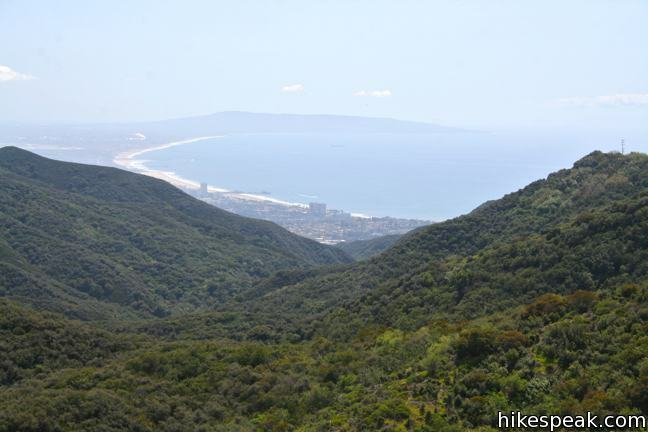 To the south is a long view down Temescal Ridge toward Santa Monica Bay. Take in the plentiful views before returning south or continuing north. 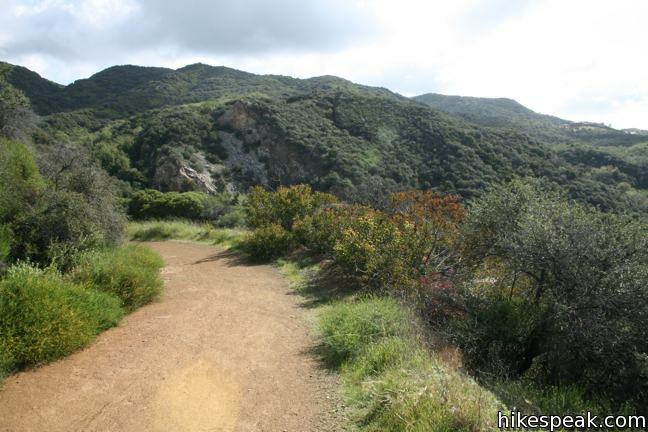 To extend the hike, drop back down to the Backbone Trail junction and turn right, taking Temescal Ridge Trail across a long saddle to Hub Junction, half a mile to the north. 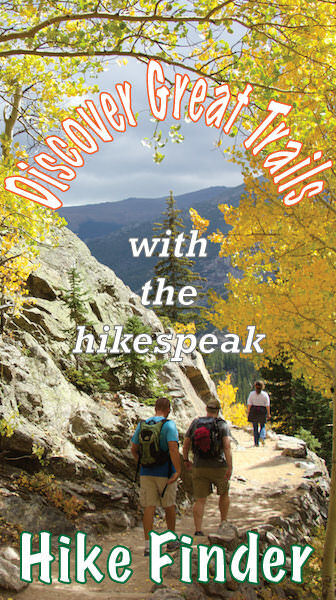 This major trail intersection allows hiking in new directions. 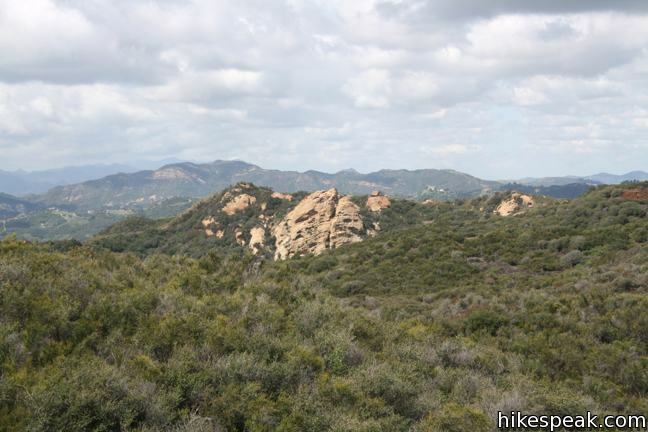 One fine extension is a 2.5-mile loop to Eagle Rock, a scenic sandstone summit to the west. 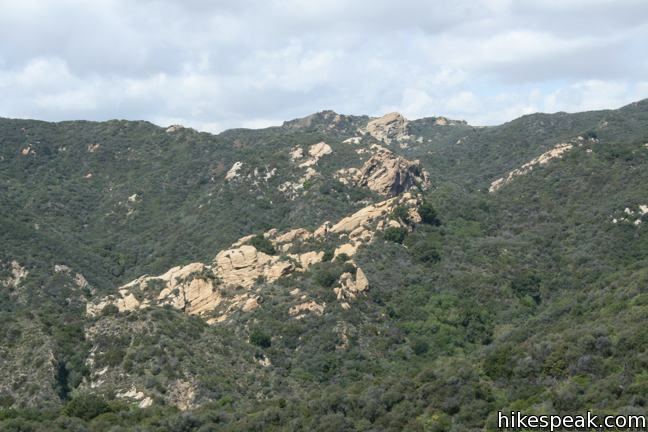 Alternately, those who hike up to Eagle Rock from Santa Ynez Canyon or Trippet Ranch may hike an additional 1.85 miles (one way) to summit Temescal Peak. 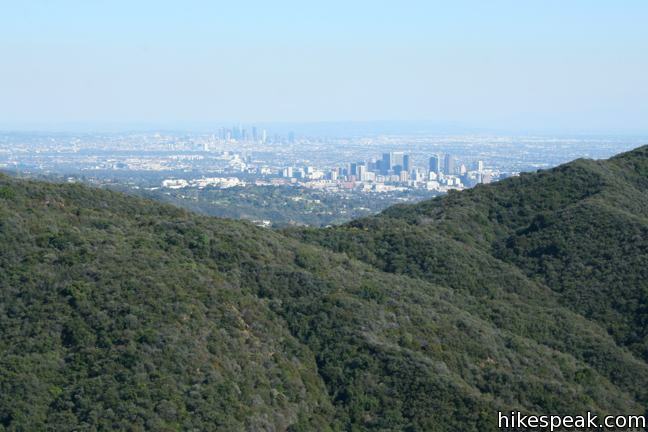 Another way to reach the peak is to hike up to Hub Junction from the north from a trailhead at the top of Reseda Boulevard. 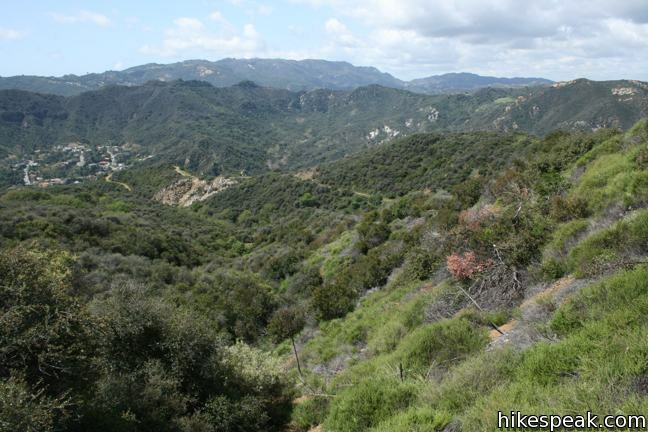 No matter how far you hike in Topanga State Park, you are sure to enjoy immense views over a truly scenic stretch of the Santa Monica Mountains. 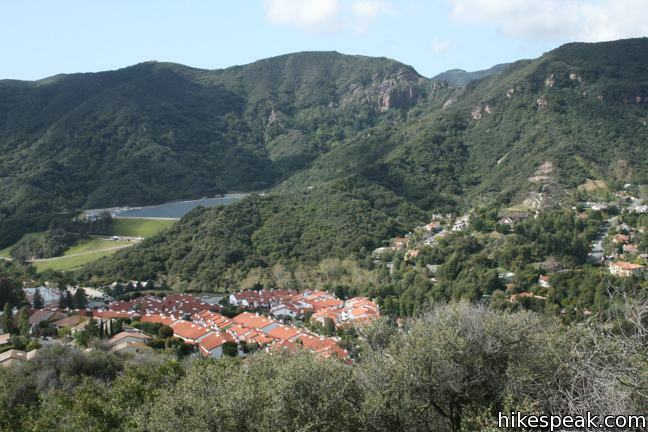 This trek up Temescal Ridge quickly transports hikers from city streets to mountain peaks for a refreshing immersion in nature. 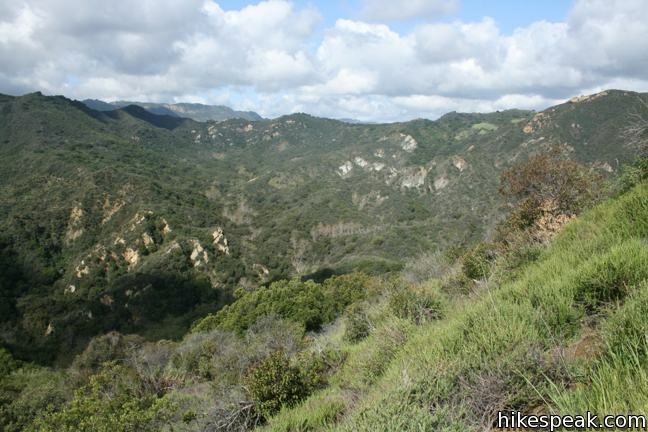 No fee or permit is required to hike to Temescal Peak. Mountain bikes are welcome, so get out and enjoy. 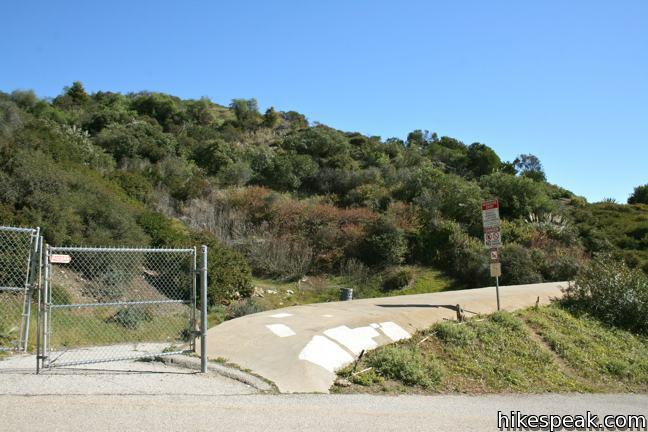 To get to Palisades Highlands Access Trail: From Sunset Boulevard, half a mile east of PCH, head north on Palisades Drive. After 3.3 miles, continue straight on Chastain Parkway for another half a mile. Turn right on Via Las Palmas, and drive two short blocks up to the trailhead parking on the left. The trail will be on the right. 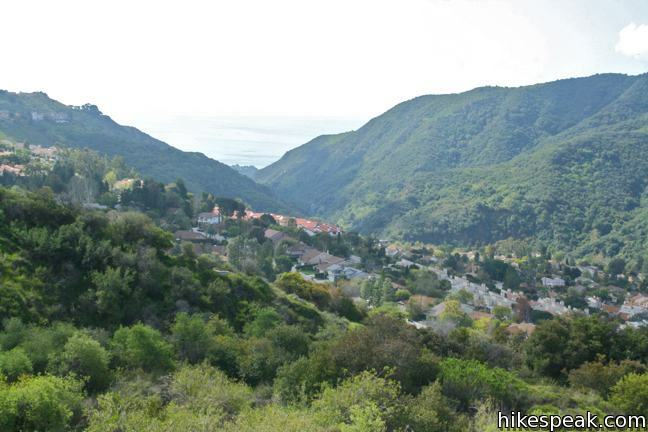 To get to Trailer Canyon Fire Road: From Sunset Boulevard, half a mile east of PCH, head north on Palisades Drive. After 2.4 miles. 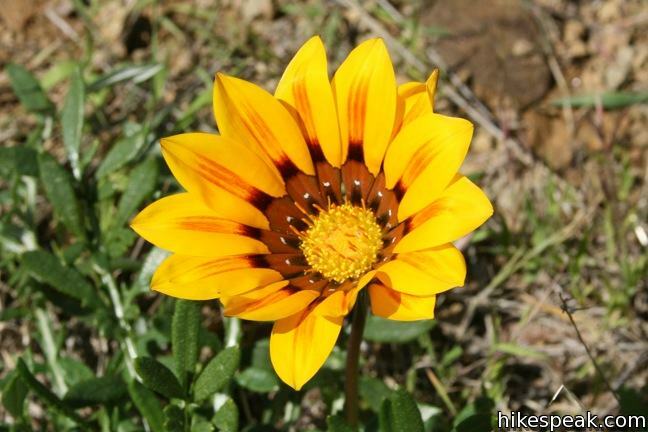 Turn left onto Vereda de la Montura, (the same turnoff for the trailhead for hikes in Santa Ynez Canyon to Santa Ynez Falls and Eagle Rock) and make an immediate right on Michael Lane. Drive half a mile to the trailhead, which will be on the left. Street parking is available on Michael Lane. Can dogs go on the Fire Road and can they be off leash? Have you encountered any rattlesnakes on the Fire Road? Will the trail be open Christmas Day?